My thoughts on Ham Radio … and everything else, too! This weekend I dabbled in the FT8 Roundup. 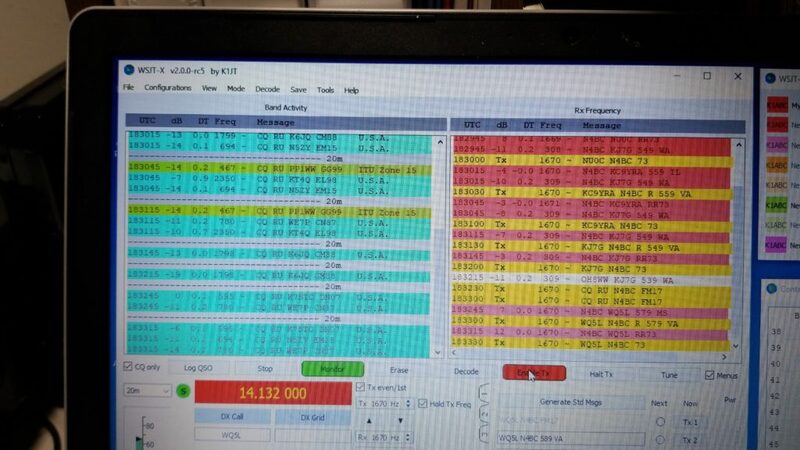 I was on the air when I had some free time, and made a total of 70 QSOs … not even a big effort, but it was interesting. When the contest first started, there was lots of confusion, especially about operating frequencies. The normal frequencies were not used … special ranges of frequencies were specified. Also, there were several settings that had to be changed in the software itself, and that confused some. The instructions were well-written, and I had no problems at all. To do things right, it was necessary to go into the files and create backups and then delete specific files. I was leery of that, but I followed the instructions to the letter … no problems were noted when restoring everything afterwards. I even worked another ten stations afterwards to make sure everything was copacetic (HA! Look that one up!). SO … everything is back to normal, all the contacts are uploaded to LOTW, ClubLog, eQSL, and QRZ, and I’m already seeing some confirmations, minutes after the contest. Have you been a ham long enough to remember contests back in the “Dark Ages”? Submitting a log then was a real trial … dupe sheets, deciphering handscribbled logs, counting multipliers, computing scores on your fingers and toes, snail mail submission … like I said, the “Dark Ages”. Soooooo much easier now! Of course, my mouse quit working during all of this. “Must be the battery,” says I. I replace the battery … still bad. Look all over the house for a spare mouse. Finally, a light went on … I tried another AA battery … success! The first replacement was no good. I need to turn in my Technician badge! Hope you had a good ham weekend. I had thought about pulling out my manual tuner and making some contacts in the 160-meter contest, but I was busy enough with what I was doing. There’re never enough hours in the weekend, are there? The next few weeks leading up to the holidays are going to be hectic … banquets, dinners, parties, concerts … all sorts of things to keep me busy. But, I’ll still do radio when I have a chance! Next Next post: Hey! Where’d they all go? WB3GCK QRP Amateur Radio Little radios, big fun! Astrid's Embroidery & Screen Printing Very fast and quality work. I highly recommend them! CW Morse CW Morse Code Keys – Made in the USA! Ham Radio with K0PIR Helpful videos about ham radio equipment and software.